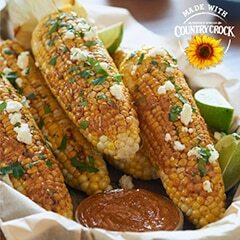 Stir together Country Crock® with Sunflower Oil, lime peel, chili powder, paprika and cayenne pepper. Set aside. Bring a large pot of water to a boil. Add corn, cover and cook for about 5 minutes. Drain and let cool slightly. Spread each corn cob with 1/2 Tbsp. chili lime spread and enjoy immediately. Pro tip: Sprinkle with cotija cheese, if desired.